The debate between Steel or Aluminum heddles and Texsolv is an ongoing one. For the most part it is personal preference combined with a little physics and science. heddle that uses a tie-up system. This means that you literally tie your heddles to the shaft (aka harness) loom to create the heddles that your warp is strung though creating division and allowing for weaving. 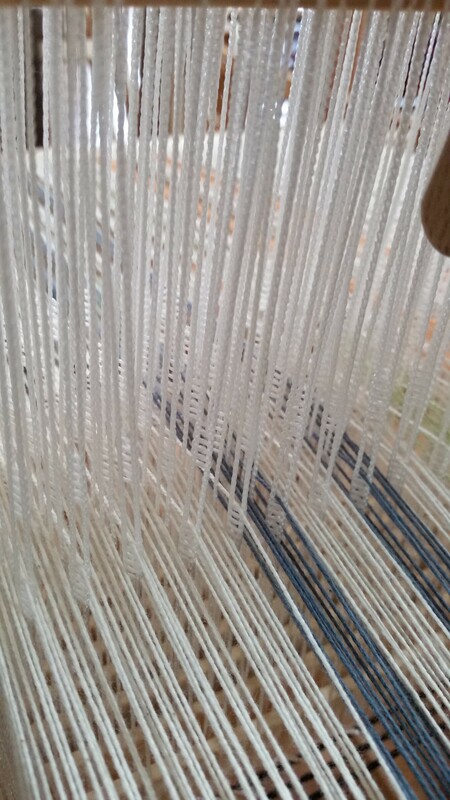 As the warp is strung through the heddle a shed is created and by changing the shed by using the shafts different patterns or weaves are created. 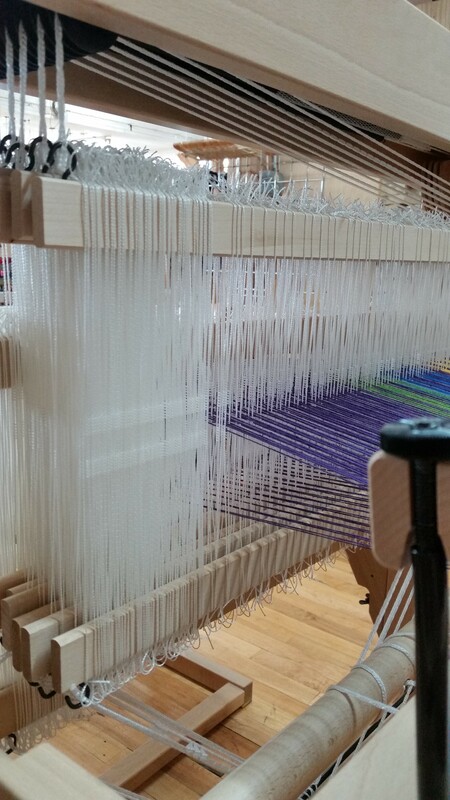 The debate of the heddle comes occurs only in non-ridged heddle looms. Every loom has a shaft that the heddles are attached to, the number of shafts changes how different strands of the warp can be lifted or lowed to create patterns in the shed. If a tea towel has 350 warp thread then there are an equal number of heddles. The debate between Texsolv and metal heddles comes from 2 different places and what you need from your loom and your weaving. Here is a basic out lay of the pros and cons of both different types. There is less weight, no jingling. These heddles are flexible and soft so they make little noise and are considerably lighter for manipulating the shafts when weaving. Their construction is a ladder formation and therefore don’t stretch but break with extended wear and tear. They are while but you can color them with sharpie or paint to differentiate from the shaft. They are usually used for shafts that have no side supports. Texsolv System heddles are made in joined 100- heddle bundles. Heddles slide easily on harnesses or shafts. The open construction of heddles facilitates threading and eliminates friction on warp. Because they are tied on and designed as such there are series of Loop cords and a peg locking system. This allows for maximum adjustment in the height of the heddle. There is very low fiction with Texsolv and therefore often less breakage when working with fine fibers like silk. There is often less breakage with handspun or varied warps. Because the heddles have flex and give they can be set up to exert less stress on the warp fibers. The heddles tie onto place so if you miss your count and need a heddle somewhere in the middle of the warp. This is a disadvantage too as precision is what makes weaving so lovely. This is not a magic get out of trouble warp. Some of the downsides… they are not as easy to move along the shafts so if you need to slide them it will take time. they are flexible so finding the perfect tension takes time, and practiced manipulation. Furthermore fluffy yarns are more likely to catch, when working with mohair the halo is more likely to wrap and bind with the heddle. 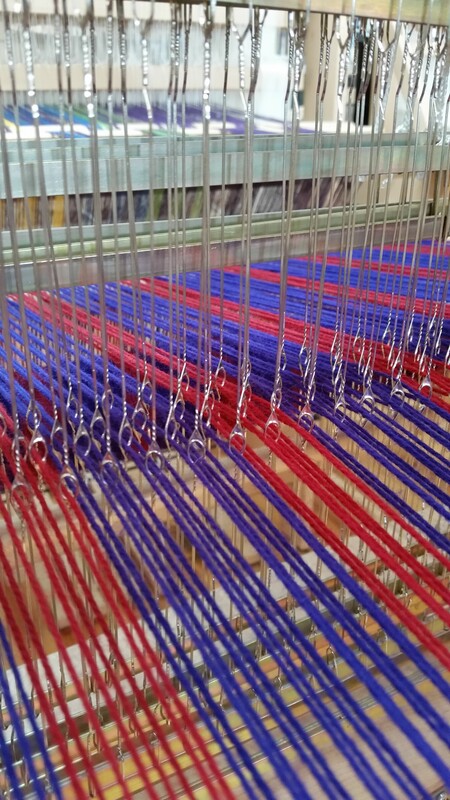 These heddles are heavier than Texsolv and therefore often used on Jack Looms where gravity is used to drop the shafts. This extra weight gives the sensation of a firmer drop. That firm drop comes with noise as the heddles click against each other. Some people find the sound soothing while others are annoyed. The metal heddles have some downsides, they lead to trouble with splitting fine fibers like silk warp leading to more breakages. 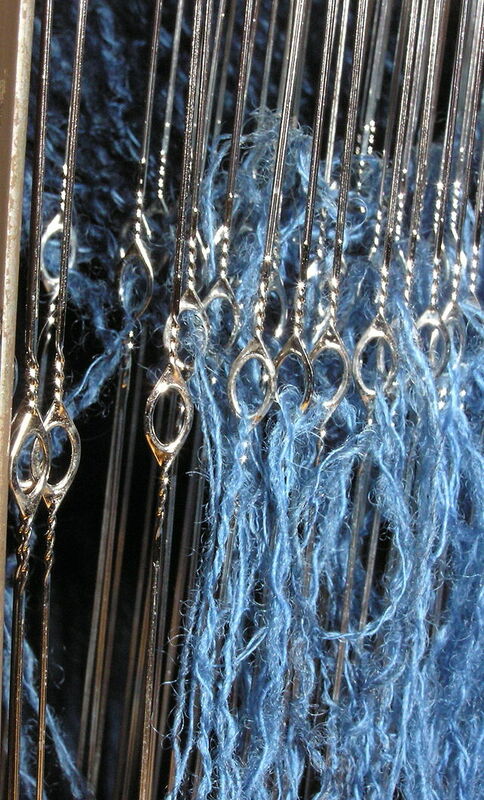 However, they almost never bind up with over twisted or haloing yarns. They can withstand more stress and use while lasting longer than Texsolv but are likewise more expensive. Some people find that warping on metal heddles is easier as the heddle has less flex and that tensions can be more easily set both on the different shafts and the over all warp without adding extra stress on the warp. You should know that neither is perfect for every loom, project or weaver. You can make either work as you need to sometimes it takes some adjusting. Try either and figure out what is perfect for you and your project. Next articleNoro Knitting Magazine: Color!